BreakPoint ministry, founded by the late Chuck Colson and chaired by Timothy George, appears to be making a clean break with junk historian David Barton. While Barton and his deputy Rick Green continue to claim their only critics are left-wing, anti-Christian academic elitists, more and more conservatives are distancing themselves from Barton. David Barton was American evangelicals’ favorite historian. He taught us about the Founding Fathers’ almost uniform commitment to Christian principles, and secular historians’ attempts to bury our Christian heritage under reams of revisionist distortions. He gave us firepower in support of our mission to return America to its godly founding principles. He gave us what we wanted. 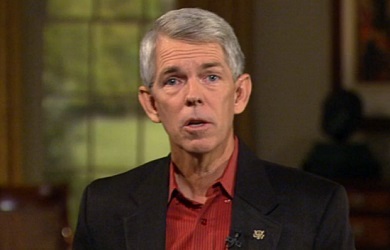 But now David Barton has been credibly charged with serious distortions of his own. The story has been told in both the secular and the Christian press: Barton’s most recent book, The Jefferson Lies, was riddled with misinformation. Its publisher, Thomas Nelson, pulled it from distribution. Barton is standing firm in his position, but reliable historians—strongly conservative Christian scholars among them—continue to hold him in error, and not just because of this work but because of others as well. I am no historian, so I am in no position to form an independent judgment of his veracity. Few of us are. But that doesn’t excuse our eager acceptance of his inaccuracies. With a bit of care, any of us could have known of the serious questions that have surrounded Barton’s work for a long time. These recent revelations are nothing new, except in the degree to which conservative Christian scholars are involved in calling him to account. Nevertheless we became for him a devoted cadre of disciples. We knew our country’s founding principles were vitally important. However, so is historical accuracy. It looks as if Barton compromised one to make a case for the other. If the signs have been there for some time, why then did we love Barton so? And is it possible that we share the blame? Barton fended off criticism by blaming it on the liberal academy’s antipathy to Christianity. That had more than a little believability to it. I am quite sure that liberal academics often hold to an ideological agenda that motivates them to discredit Christianity’s part in our nation’s history. Thus, it was easy (and it still is) to be suspicious of their criticisms in this case. But the ideology defense is no help when it’s conservative Christians making a case against Barton—especially when it’s a case as verifiable as this is proving to be. It’s not political opinion that’s stacking up against him now. It’s well documented facts. To accept any human teacher without checking on his message with due diligence is to abandon our responsibility to the truth. David Barton’s errors are not only his. They also belong to those of us who bought his message carelessly, unquestioningly, too eagerly, and too comfortably.